Gordon: This is Gordon Pepper, and I want to know if Chico has recovered from his hangover from the last show. Chico: Perhaps yes, perhaps not... I'm Chico Alexander, and from somewhere in America, WLTI is on. And here's a change... it's just the two of us to start. Gordon: We start out with 2 - but we will get more as we look at next season and we aim to give out some whammies - but let's look at what we got this week, starting with Big Brother. The twins have been separated - surprised? Chico: Let me think about that... Okay, I'm done thinking. Question now, is the other twin on the way out now that Marvin's the man of the hour again? Gordon: It depends on the veto, but it surely isn't looking good, as Nakomis and company want her out for getting rid of Will, while Diane and Drew may use her as a sacrifice to keep their own under the radar. How will Will react to see Karma rebounding this quickly? Chico: He's going to be pleased, of course. They get the place by the porch at the jury house, of course. Gordon: maybe he'll have some time to explain to her that karma does not mean Carmen Electra. Chico: He'll have to take up his whole week. Gordon: Well, they have time. Who is playing the best game? Chico: I'd have to say the relatively low-key Michael. the radar - but the smarter thinking people have to know that he is a sentimental threat to win the whole thing and I would think he would be toast as we get to the final 5. If anyone who is not Michael or Marvin wins the HOH next, they should both be on the block. Race. Now it's the Dunder Twins who have to overcome the penalty of poverty. Can they? Gordon: Uhhh.....nnnnnno. I've been very impressed with how the bowling moms got out of a jam, but this requires something that the dunder twins don't have - intelligence. They will need a MAJOR blunder by one of the other teams to get back in it - and I don't see it. The only other option - a Fast Forward or Yield situation, which we haven't seen in a while, so it could come into play here. don't know...That's something I haven't seen since Alison and Donny elected not to use it. need it to happen on the next episode. Either that - or a surprise team of Holly and Jase entering into the race. Gordon: The Amazing thing is that you will have at least one woman winning this thing - something that has only happened once in the series so far. I think Chip and Kim make the final 3 - but I'd have to give first to Colin and Christie who have been solid throughout the whole competition, with Brandon and Nicole in second. deep with other countries around the world... Arrogant Americans pushing other people around. Gordon: Unfortunately, you don't get penalized for being arrogant or annoying. Gordon: Could the yield play a factor in this? Chico: I think so.. IF we get to see it. Chico: Okay, that concludes the dancing portion of the show. Gordon: Someone who is feeling the heat is GSN, which got universally panned at the GSC. Do you think that the pool or horseracing show will do anything for them? Chico: In a word... No. I don't think it could get any worse for the network... or could it? concept could work. Besides cards, the second most popular thing to do in college atmosphere (besides getting drunk in frat parties) has to be playing pool. That is the demographic that GSN is exactly targeting. incorporate something that will make people watch... You know, outside your usual run-of-the-mill poll game. watch as the other sports, but if they really put the characters into this idea, I think it could work. :) Some good news, though... Dodgeball returns for a second season! CPA, all the way, baby. biased favorite team to win again - but until the other teams get women that can match up to the CPA, there's good reason to think that the CPA can win the whole thing again. Is there any team that you think can top the CPA? sleeve, no way. We'll have to wait until early 2005, though. Gordon: Thought if the ratings for the other shows falter, I can see ED very quickly being recalled - speaking of which, we finally get to see the Lingo Tournament of champions. Gordon: Could it be because GSN hasn't advertised it? Gordon: The Lingo tournament will be aired on the Monday of the Labor Day Weekend. Chico: Yay! But how'd you find out? Gordon: I found out from covert spy camels, who were carrying the information in their humps. mismanagement. You have the special event from the show which gave GSN the highest ratings up to date and it's the staple of the network, yet NO ONE knows about the event that was the highlight for the third season. The show, BTW, that carried them through some bad times and is still one of the highest ranked shows on the GSN schedule. What is GSN possibly thinking here? And why are you stick this tournament on a weekend where everyone is out and no one would be watching TV in the first place? Wouldn't you want maximum viewership by airing this as an all-week tournament special event? Gordon: Set up the board, Chico. will return this fall. New episodes, you think? Gordon: This is how a game show should work. Chico: doo bee doo be doooo..
Gordon: Watch out for the penguins. Tuesday, Extreme Dodgeball and The Mole. Dodgeball - enough said. Chico: Ratings for the Mole... well, needless to say, tanked. Gordon: We'll be repeating this phrase over and over again, but reality show serials do not work in repeats. CBS aired the whole first season of Survivor mode in repeats against the Olympics in 2000 to dreadful ratings. think GSN knew this (in a rare fit of brainpower) and decided to give ED a rest before its new season. Wednesday - We only see six of the Fake-a-Dates, and judging from public outcry, I think that's all we need to see. premise, Marriott will not be making any millions on tv as a reality show host. Chico: Well, Fake-a-Date worked in that it had a blind-date setup that even GSn couldn't screw up. talent, Marriott doesn't, as he contributes nothing to the screen and delivers his lines as exciting as cardboard, which in this case left us feeling cardbored. Chico: Now we go to Thursday. Chico: Kenny vs. Spenny was to be GSn's token bit of comic mischief. repeats of shows that people haven't seen before that are very entertaining. best Canadian humor for my money... Kids in the Hall. Gordon: Best Canadian Humor is Colin Mochrie. schedule, but relegated to weekends. You know, it was funny when it aired on NBC, but at the same time, felt disjointed, even by newly enacted GSN standards. Gordon: When it was on NBC, it was new, and when you have something new as a novelty, you manage to overlook the flaws in the armor - but in a repeated situation years later, you see everything - and SpyTV did not age well. Chico: And Vegas Weddings Unveiled? Well, we just don't like talking about that one. 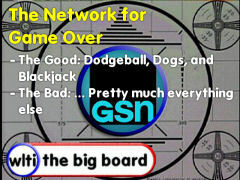 Gordon: So if there was one show that should be n GSN's lineup that isn't - what should it be? proved, quality doesn't translate well into quantity. Gordon: Two Words. Fear. Factor. Gordon: They should have been very aggressive to get that show. We don't get that - instead we get Next Action Star, whose ratings were so bad that they cancelled a Next Action Star marathon. Chico: But all is not lost... at least for now. In their place: Greed, WSoBJ, Dog Eat Dog (which has turned into somewhat of a success story... not saying that they could order more...) and Weakest Link. Chico: He's saying please, GSN. Gordon NEVER says please. Gordon: And PLEASE stay with us, as we switch from the past to the future with the new shows coming in - and we continue the Big 5 with results and another new poll. Chico: But now... we dance again.